The Tao Sutra is a collection of koans, illustrated with accompanying photographs, that delve deep into the human existential questions, seeking meaning in the ordinary life that we live, always looking for a higher cause to celebrate, mostly with a dash of humor. Written as an exchange of questions and answers between the Tao and his students, and peppered with short stories, they bring out the essence of human wisdom in easy to understand form. 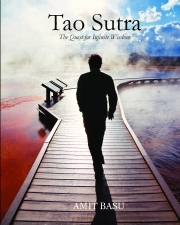 What makes Tao Sutra unique is in its derivation of knowledge and wisdom from everyday deeds, frequently veering into contemporary life and its peculiarities. In the first book, "The Quest for Infinite Wisdom", the Tao is everybody. He is the teacher, the student, the dreamer, the lover. He is enlightening and confusing at the same time, lucid but deep. He laughs at the life we live, our desires, our vanity, the games we play, our sense of insecurity; but he laughs with us, as one of us. The subject matters are varied, from birth and death, happiness, beauty, gun control, to social media, Internet, and obsession with modern gadgets. It shines a light on the idiosyncrasies of human beings, showing the simple truths that are at the heart of an increasingly complex world. Amit Basu is an author based in California. In addition to writing occassional words of wisdom, he is an avid photographer with a travel bug. Mildly philosophical, devoid of any madness, and therefore lacking any genius whatsoever, Amit spends his ordinary life doing ordinary things. In the time that he is not earning his keep, he dreams of all the books that are yet to be written, all the photographs that are yet to be taken, all the places that are yet to be seen, and, strangely, all the ear-rings that he hopes to make. Ask him about the biggest challenge facing mankind, and he will say, without blinking an eyelid, that it’s conquering sleep. Try as he might, he finds that fighting sleep is hard. So he uses that time meaningfully, dreaming.